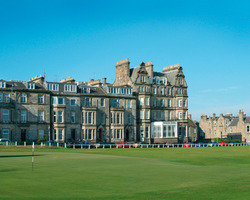 The Old Course Hotel is located adjacent to the St. Andrews Old Course - home of the Royal &amp; Ancient Golf Club, the most historic and famous golf club in the world. Golf Pilgrims travel from all ends of the earth to play these hallowed grounds. The hotel just completes the experience with completely deluxe service, friendly lounges, restaurant and bars. It also has a private locker room for golfers. The suites offer views of the Old Course. The BEST WESTERN Scores Hotel is the closest hotel to the 1st tee of the world famous Old Course and the Royal and Ancient Clubhouse. A 5 minute walk will take you to many of the town's attractions including the ancient castle and cathedral ruins, the 600 year old University (Scotland's oldest) and the historic town centre. Whether travelling on business or pleasure, exploring the sight of St Andrews or experiencing the thrill of the Old Course first hand, the BEST WESTERN Scores Hotel is the ideal choice for visitors to St Andrews, golfers and non-golfers alike. The hotel occupies two traditional Victorian Town Houses dating back to 1864 and 1880 and retains many of the large former drawing rooms as Junior Suites. There are 36 rooms in total, many of which have stunning views over the West Sands beach whilst other enjoy an outlook over the landscaped garden and terraces. *For Summer Months (5/1/19-10/7/19), there is a minium of 1 night required that must include dinner. Just a few minutes walk from the center of the village and with many rooms overlooking the St. Andrews Old Course, this four-story Victorian property is a great value to those who wish to be near the golf action but not pay the Old Course Hotel rates. Guest rooms are adequate without the refinement of the more expensive hotels in the area. All rooms include TVs, combination baths with hair dryers and other excellent facilities to help you enjoy your stay. Its "Old Course Restaurant", awarded two rosettes by the AA, serves fantastic food for breakfast, lunch and dinner. *When selecting this property, you must add a one time Food and Beverage fee per person based on length of stay. For 1-3 Nights, it is 50 pound per person. For 4+ nights, it is 100 pound per person. This is to be used at any of the hotel outlets for food and beverage. 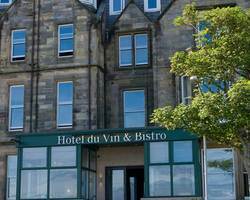 Hotel du Vin St Andrews is located overlooking the famous West Sands beach, a two minute walk from the R&A Clubhouse and 1st Tee on the Old Course. A traditional stone and slate terrace building, with stunning views over the West Sands and the bay of St Andrews, whilst being right in the heart of the old town. The property was originally a prestigious family home, and has been sensitively converted into a stylish, boutique hotel. 22 rooms and suites with monsoon showers, sumptuous beds with Egyptian cotton sheets and all the little luxuries you would come to expect in a Hotel du Vin guest room. The heart of the hotel is the bistro, serving the signature French bistro dishes with a home cooked style using seasonal, local produce.